Washington and Lee University, Lexington, VA 2007 B.S. Amy is a local to the Hampton Roads area. After graduating from Granby High School, she received her undergraduate degree from Washington and Lee University in neuroscience. She then went on to receive her Masters degree in Physician Assistant Studies from Eastern Virginia Medical School. Amy is nationally certified by the National Commission on Certification of Physician Assistants (NCCPA) to practice under the supervision of a physician and is licensed by the state of Virginia. She is currently a member of the American Academy of Physician Assistants (AAPA), the Virginia Academy of Physician Assistants (VAPA), and the Society of Dermatology Physician Assistants (SDPA). "My husband and I are both patients of Pariser and see Amy Volkmann, the PA at the Belle Harbor location. We are extremely happy with Amy as our provider and the entire staff. So glad we have this caliber of medical treatment close to our home. We highly recommend this practice and Amy if you are looking for a great dermatologist." "Amy Volkman is always professional and thorough with an outstanding "bedside" manner while the office administrative support is excellent." "Amy is great! Very knowledgeable, professional, and pleasant." 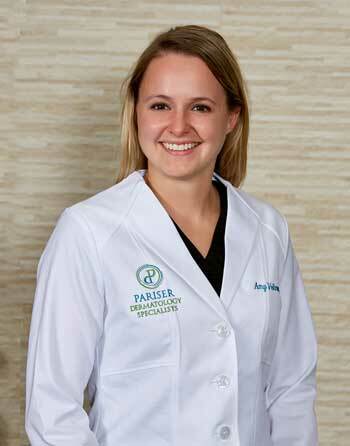 "Amy works very hard to see that her patients are being treated properly. She's always available to answer any questions I might have via patient portal or phone call. I appreciate her enthusiasm for her job." "Ms. Volkman was very thorough in her examination and I appreciated the fact that she listened to me and addressed each of my concerns." "Amy was very professional but fun - she made me feel very comfortable about my issues and answered all questions." "Amy is a true professional."